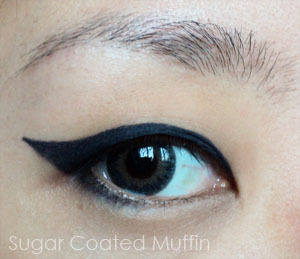 This is for Aisyah who asked about my eyeliner in this post. For those of you who are too lazy to click lol Here's the pic.. I really like winging my eyeliner actually. 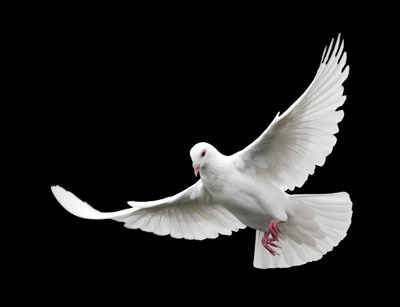 Adding that lil curve at the end just like a bird's wing when it's flying. It changes the way my eye looks. 'm only using 2 'tools' here. 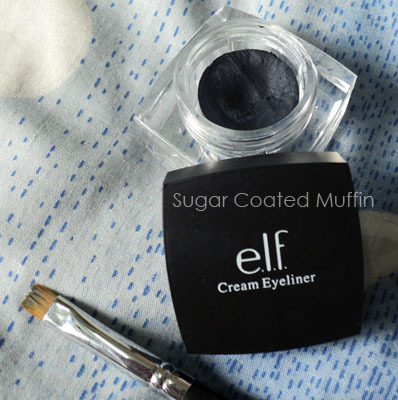 My Elf Studio Cream Eyeliner in Midnight and my favourite brush to wing eyeliners, the slanted eyeliner brush. I'm going to mix the Elf cream liner with a cream (my unused wrinkle cream lol) as it's too dry to be used. With my eye open, I mark a point above my eye to indicate the thickness I want. This is necessary as I have kinda hooded monolids and a portion of the eyeliner disappears when I open my eye. Drawing it with my eyes closed may not produce the result I want when my eyes are open. Then I just join that point to the tear duct. 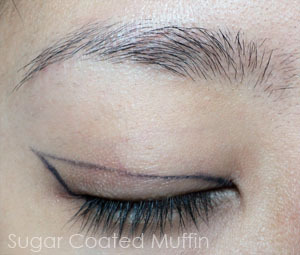 Then, I close my eye and extend the line until it joins with the wing outline earlier. Open your eye to see if she shape is okay. If not, just adjust it until you're happy. If you're not sure how the shape should be, use eyeshadow instead of eyeliner for the outline so it's easier to rub off or remove. Fill in the space! 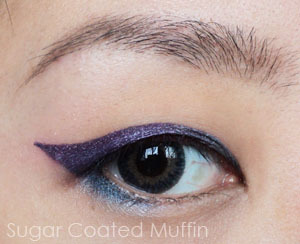 My blue eyeliner was done using MUFE's Aqua Eyes which can get lumpy and flake if you keep going over it. Hence, it is better to fill in one portion at a time. I use the flat side of the eyeliner brush so it covers a bigger surface area. Then the tip for the wing. I didn't really like the dark colour (too bold? =/) so I patted some eyeshadow on. 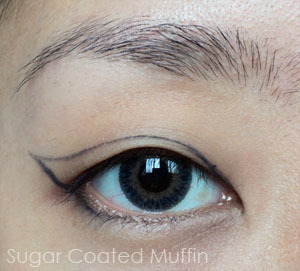 This can only be done if your eyeliner doesn't dry all the way. I have pink (which turned purple) above and blue below from the L.A. Colours Tease Palette. Since I didn't use eye primer, the excess was simply brushed away. Fill in your brows, curl your lashes, apply mascara and you're done ^_^ Usually when I use the bright blue MUFE eyeliner, I do line my eyes with black eyeliner to make it wearable. 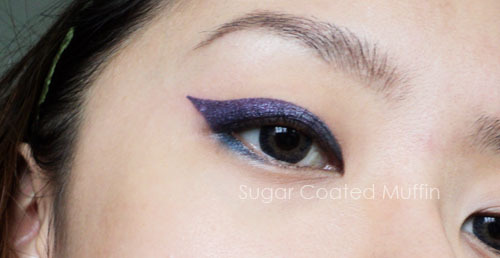 You don't actually need many different eyeliner colours (they dry out so fast too!). You can do it like me, pat on the eyeshadow or mix your eyeshadow with a mixing medium (water works too but not so good). I have not tried these but I've heard of people mixing eyeshadow with lotions or creams. I don't do this as I have oily skin and I'm afraid it'll smudge. For the mixing medium, you're supposed to wet your brush in it then pick up the eyeshadow. 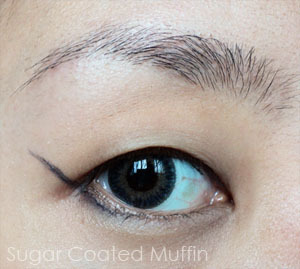 It'll go on like a liquid liner =) You can do this for longer lasting and more pigmented eyeshadow/pigments too! This method is calling foiling. I'm going to try putting eyeshadow on my liners next time. thanks for sharing, isabel. Hum. 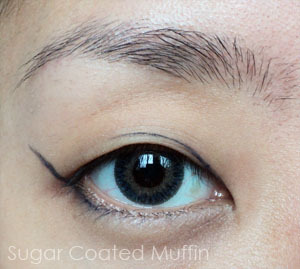 I always have a hard time winging my eyeliner but the way that you've done it makes it seem a lot simpler. I will have to give it a try.